The interest from economists and politicians in information technology (IT) is not new. However, opinions among economists about the importance of IT are divided. While Robert J. Gordon, macroeconomist and economic historian at Northwestern University, has been arguing against techno-optimism for a long time, MIT professors Erik Brynjolfsson and Andrew McAfee suggest in their recent book, The second machine age, that most of the productivity gains from IT are still to come. In our recent study (Dhyne et al. 2018 ), we provide new insights on the returns of IT by constructing firm-level IT capital stocks from an exceptionally rich data set of all Belgian business-to-business transaction data on IT purchases. This allows us to investigate which firms benefit most from IT. Furthermore, our work provides insights into the ‘Solow paradox’, which refers to the fact that we do not see much effect of IT on macroeconomic GDP growth. Since we use the universe of Belgian firms, we are able to show the micro channels of the aggregate impact of IT on macroeconomic productivity growth. Do all firms benefit equally from IT, or do some benefit more than others? We show that for very small firms with fewer than five full-time employees, an increase of IT capital by 1% pushes the firm’s value added up by 0.08% on average. For firms with more than 250 employees, the impact is more than twice as high with an average increase in value added of 0.17%. We would therefore expect that large firms invest a larger share of their revenues in IT than small firms. However, it turns out that they do not, and consequently their return on IT is higher. Figure 1 shows the differences in the return of investing one additional euro in IT (the gross marginal product of IT capital) across the firm size distribution. Increasing the IT capital stock by €1 in very small firms with fewer than five full-time employees results in a €0.92 increase in value added. The same investment in firms with more than 250 employees has a €2.55 return.1 This suggests that there is an untapped potential for productivity growth by investing in IT, especially for large firms. As large firms employ about 40% of the working population, higher IT investments in large firms would also boost economy-wide productivity growth. Another piece of the puzzle on the economy-wide impact of IT is understanding how the return varies across industries. Figure 2 displays the gross return of investing an additional euro in IT. The horizontal axis ranks the industries according to their productivity, expressed in value added per employee. The productivity of firms in industries with a high marginal product of IT capital increases when they invest more in IT. Graphically, this results in moving towards the lower right corner of Figure 2. Only a few industries are located in this region – such as information and communication, and financial and insurance – which are amongst the most IT-intensive industries. As indicated by the size of the circles, the largest part of the working population can be found in industries with lower productivity levels. Fortunately, in many of these industries with relatively low productivity, the marginal product of IT capital is relatively high. For example, the transportation and storage, manufacturing and wholesale, and retail industries all realise about €1.5 added value for €1 of extra investment in IT, while altogether these industries employ 35% of the working population. The positive relation between IT intensity and productivity suggests that these industries would realise substantial productivity gains by investing in IT. Next, we decompose GDP growth into primary input growth (capital and labour deepening) and productivity growth to assess the importance of IT capital at the macro level. First, we look at the contribution of capital and labour deepening to GDP growth. Figure 3 shows all the mechanisms at work, and their individual contribution to Belgian GDP growth over the period 2002-2013. While the Belgian economy grew (on average) 2.2% per year between 2002 and 2013, the contribution of IT capital deepening was only 0.08%. This is especially driven by a decline in IT investments during and after the Great Recession of 2008-2009. Before the recession, the contribution of IT capital deepening was on average 0.19%, but afterwards, in 2010-2013, there was no contribution to GDP growth from IT capital deepening. This suggests that the Great Recession resulted in firms forgoing investments in IT. This post-recession underinvestment in IT explains the low overall contribution of IT capital deepening to GDP growth. Second, we look at the contribution of productivity growth to aggregate GDP growth. While productivity growth was only 1.29% (on average) between 2002 and 2013, it accounted for the largest part of GDP growth. Despite the post-2000 decline in productivity growth (Van Ark 2014), firms generally increased their IT investment intensity. 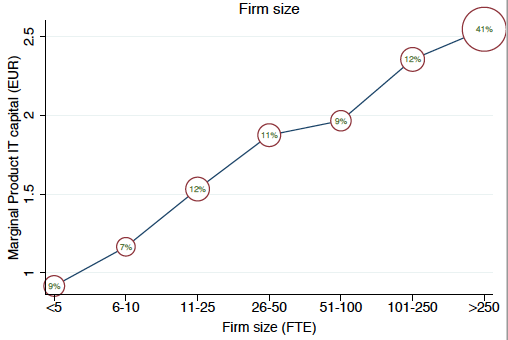 As shown in this study and earlier firm-level studies, IT investments provide large returns to firms. So how can these two findings be reconciled? To understand how IT relates to productivity growth at the country level, we distinguish between: (i) within growth, which occurs when all firms become more efficient, and (ii) reallocation when there are more (fewer) investments in firms where the potential return on investments is high (low). IT reallocation contributed, on average, 0.73% to Belgian productivity growth. So, the mechanism by which those firms with high returns on IT actually invested in IT accounted for more than half of total productivity growth. What is particularly striking is that this number is entirely driven by the pre-recession period. For the years 2010-2013, the average contribution of IT capital reallocation to the productivity growth fell back to a mere 0.09%. This indicates that IT did contribute to Belgian productivity growth. However, this was particularly the case before the recession, while afterwards firms that should have invested in IT did not do so. This suboptimal allocation of investments is one part of the puzzle of the slowdown in productivity growth after the Great Recession. Not all firms are equally productive. Even among firms that produce very similar products, there are large differences in production efficiency. 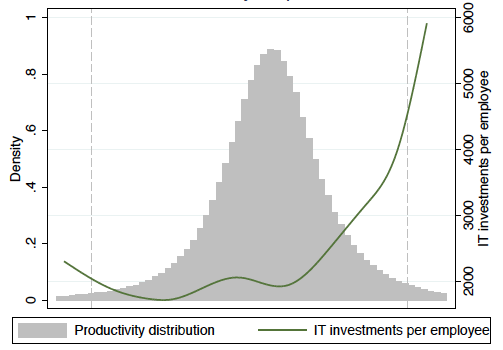 The dashed vertical lines of Figure 4 show the 10th and 90th percentiles of the productivity distribution,2 and the green line shows the average IT investments per employee. A firm in the 90th percentile of the productivity distribution is about four times as productive as a firm in the 10th percentile of the productivity distribution, while average IT investments per employee are about five times as high for a firm in the 90th percentile compared to a firm in the 10th percentile of the productivity distribution. For the US, the earlier literature found that IT explains 8% of dispersion in productivity across firms. 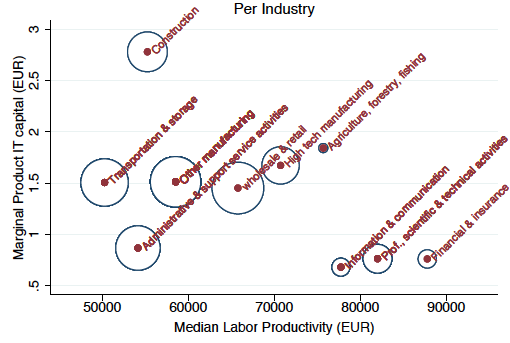 For Belgium, about 10% of the productivity dispersion between firms can be explained by IT. The key takeaway is that IT and the productivity of firms are very closely related. While all firms benefit from IT, it is the largest firms that benefit most. Furthermore, the gross marginal product of IT capital is relatively high, with €1.5 added value for €1 of extra investment in the majority of relatively low-productivity industries. When reconciling firm- and industry-level returns of IT investments with the growth of the Belgian economy, we find that IT did contribute to national GDP and productivity growth. However, this was only so until the Great Recession of 2008-2009. The recession seems to have had a scarring effect and resulted in firms forgoing investing in IT. The policy implication is that providing an economic environment which facilitates achieving optimal IT investment levels could help to invigorate productivity growth. Dhyne, E, J Konings, J Van den bosch and S Vanormelingen (2018) “The return on information technology: Who benefits most? ”, CEPR Discussion Paper 13246. Brynjolfsson, E and A McAfee (2014), The second machine age, New York: W.W. Norton & Company. Gordon, R J (2016), The rise and fall of American growth: The US standard of living since the Civil War, Princeton: Princeton University Press. Gordon, R J (2012), “Is US economic growth over? Faltering innovation confronts the six headwinds”, NBER working paper 18315. Van Ark, B (2014), “Total factor productivity: Lessons from the past and directions for the future”, National Bank of Belgium working paper 271. There can be multiple reasons for such high returns, including adjustment costs and unmeasured complementary assets that cause frictions for investing optimally. Whatever the reason, an increase in IT capital would not only lead to increased output, but also to growth in (measured) multifactor productivity, especially in large firms. We refer to Dhyne et al. (2018) for robustness checks on the result that large firms benefit more from IT. The productivity distribution ranks firms according to their productivity level. The firms with the lowest productivity are left of the 10th percentile line, and the firms with the highest productivity are right of the 90th percentile line.